Southwest Montana is particularly vital ground in the effort to link Greater Yellowstone’s grizzlies with other subpopulations. As bears continue to recover there and expand their range beyond the national park, Wildlife Management Institute has partnered with Red Rocks Lakes National Wildlife Refuge on a two-year effort to develop educational programs that will reduce bear-human conflicts west of Yellowstone. 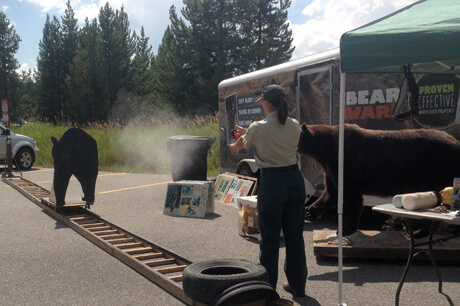 From training the next generation of bear conservationists to installing bear-proof containers in campgrounds, we’re behind this effort every step of the way. 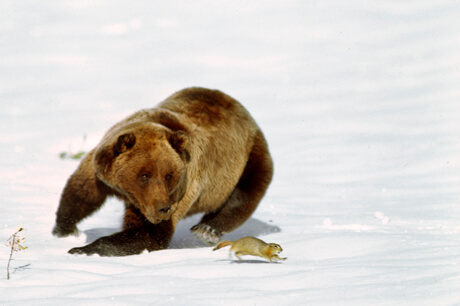 Whether on the Rocky Mountain Front or the Yellowstone Plateau, grizzlies and cattle don’t mix well. Since 2002, the National Wildlife Federation has worked to retire the most conflict-prone grazing allotments on public lands in the Greater Yellowstone Ecosystem. Vital Ground is proud to have supported many of these efforts, totaling more than 400,000 acres retired. 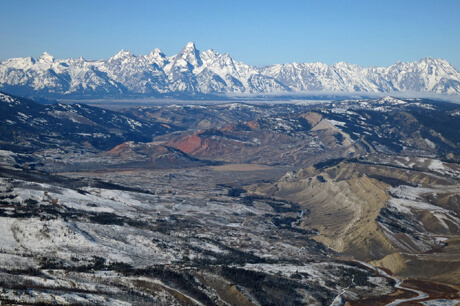 Our latest partner grant to NWF supported the retirement of the 22,000-acre Upper Gros Ventre allotment in the Gros Ventre Range of Bridger-Teton National Forest. In the four years leading up to the retirement, NWF reported at least 12 grizzly bear and 15 wolf conflicts on this allotment southwest of Yellowstone. Now, with the land retired from cattle grazing, natural cycles will resume, with new elk habitat opened up, a move that could help reduce the need for artificial elk feeding at Jackson Hole’s National Elk Refuge to the west. 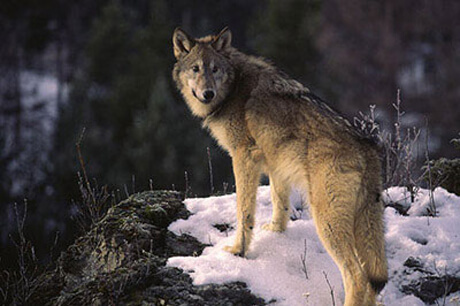 While cattle depredations grab most of the headlines, sheep present another chronic source of conflict for grizzlies and wolves in the Greater Yellowstone area. Located east of Grand Teton National Park in Wyoming’s Shoshone National Forest, the Dunoir grazing allotment brought sheep ranching and wildlife conservation into direct conflict, with its backcountry along the East and West Dunoir rivers allowing livestock into a known stronghold for Greater Yellowstone grizzlies, the Washakie wolf pack, and many other wildlife species. Our partnership with the National Wildlife Federation helped retire 34,500 acres of this 49,000-acre allotment. Grazing will now be confined to lower elevation areas near existing development, greatly reducing conflict opportunities and opening the high country back up to the natural cycles of bears, wolves, elk, mule deer, and much more. When wild animals leave a national park, chances are they don’t know it. But for grizzlies and wolves leaving Yellowstone to the south, the unwitting act has historically opened them up to the risk of conflict with livestock and the ranchers who manage them. That’s no longer the case across 178,000 acres surrounding the Upper Gros Ventre River in Wyoming’s Bridger-Teton National Forest. With support from Vital Ground, the National Wildlife Federation brokered a massive retirement of the Bacon Creek and Fish Creek grazing allotments within this wildlife stronghold. With more than 50 different grizzlies tracked in this area in the three decades before retirement, we’d say it was high time to return this land to its native species. More than 100 conflicts between domestic sheep and grizzly bears plagued the Ash Mountain-Iron Mountain area between 1999 and 2003 alone. If that’s not a red flag, we don’t know what is. 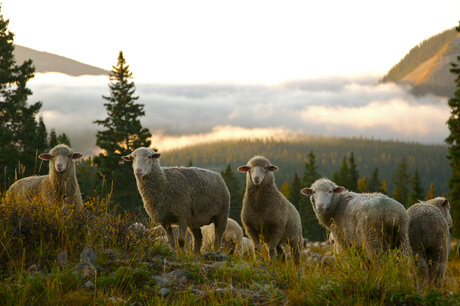 Spanning 74,000 acres of the Absaroka-Beartooth Wilderness on Montana’s Custer-Gallatin National Forest, this massive sheep allotment stood directly adjacent to Yellowstone National Park’s highest-density grizzly and wolf strongholds. With many ranchers agreeing that retiring the allotment was a win-win for people and wildlife, we eagerly lent support to the National Wildlife Federation’s effort to reduce conflict all around. Wildlife that range west from Yellowstone meet a rugged landscape of big mountains, deep valleys, and mixed-use land. Within Gallatin National Forest near West Yellowstone, MT, the 2,400-acre Horse Butte cattle grazing allotment spelled conflict for the recovering Yellowstone grizzly population. Such conflicts that close to the park measurably reduce the chances of grizzlies and other wildlife finding safe passage between Yellowstone and the Bitterroot ecosystem to the east, a long-term linkage goal for grizzly recovery. So we eagerly supported the National Wildlife Federation’s buyout of the grazing lease, securing the area as a wildlife sanctuary once more. As a bonus, the move opened up new winter habitat for the Yellowstone bison herd, helping return another native species to its old stomping grounds. 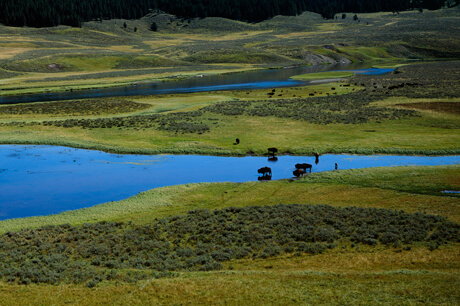 There’s a reason the Blackrock-Spread Creek grazing allotment marked our largest investment in the National Wildlife Federation’s ongoing work to retire conflict-prone leases in the Greater Yellowstone Ecosystem. Roughly 25 miles long and seven miles wide, this sprawling acreage just south of Yellowstone in Wyoming’s Bridger-Teton National Forest is absolutely prime grizzly habitat. The allotment bridges Yellowstone, the Teton Wilderness Area, and Grand Teton National Park, three huge cores of protected habitat. Returning the Blackrock-Spread Creek area from cattle grazing to wildlife was the missing piece in establishing a vibrant corridor from Yellowstone to points south. That’s work we’re proud to support. West of Yellowstone National Park, the Island Park area of Idaho’s Caribou-Targhee National Forest represented an early hotspot for grizzly connectivity. Bears and other wildlife ranging west from Yellowstone would likely pass through this region on their way into the Centennial Mountains of southwest Montana, a gateway to large tracts of public land and, eventually, the Bitterroot Ecosystem. Grazing allotments make such movements much riskier, with livestock conflicts often spelling death for grizzlies. As Yellowstone’s bear population recovers and expands, strategic allotment retirements help strike a balance between wildlife and agriculture in the region. With important habitat around several creeks and West Lake, the 12,536-acre Mickelson sheep allotment promised only more conflict. That made it a no-brainer to support the National Wildlife Federation’s buyout of the acreage, returning it to its native species and natural cycles. 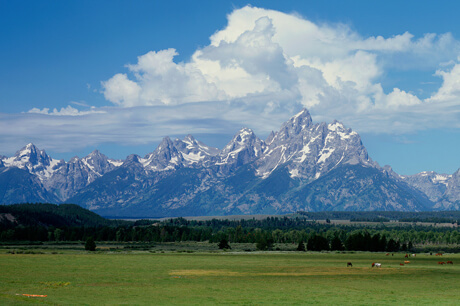 There isn’t a range in the Northern Rockies more iconic than the Tetons. From beneath their jagged summits in Grand Teton National Park, Moose Creek flows west into Idaho, leaving the park and entering Caribou-Targhee National Forest. 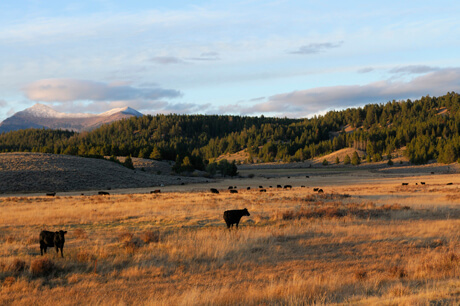 Much of its watershed lies within the Jedediah Smith Wilderness Area, but this rich habitat remained open to cattle and sheep grazing until our partnership with National Wildlife Federation helped retire the 24,500-acre allotment. 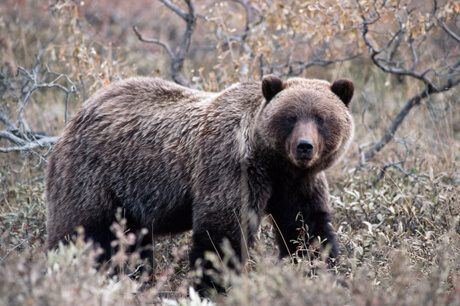 The timing was right, as an expanding Yellowstone grizzly population was beginning to reclaim the west slope of the Tetons as historic habitat. Now they can do so without the risk of stirring up conflict with sheep and cattle ranchers.